Able to weigh axle-by-axle dynamically and statically, LS-WIM systemsÂ are Legal for Trade when weighing in static mode. Purpose-built LS20™ indicator features readability-optimized LCD and intuitive keypad design. 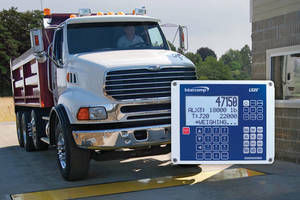 With indicator mounted where drivers canÂ enter and save 250 unique truck IDs, complete with tare weights, individual axle weights, and total gross weight,Â systems offerÂ internal memory for up to 3,000 weigh records. Data export is possible viaÂ USB drive or RS232 serial output. Minneapolis, MN – Intercomp is proud to announce exciting new updates for their LS-WIM Weigh-in-Motion Axle Scale Systems. Known for being a more efficient and cost effective alternative to older full size truck scales, American-made LS-WIM scale systems are now NTEP Certified making them Legal for Trade when weighing in static mode. Intercomp has also released a new purpose-built indicator further solidifying LS-WIM scale systems as the preferred solution for a variety of truck traffic applications. A key factor in designing the new LS20™ indicator was the LS-WIM scale’s ability to weigh axle-by-axle dynamically (in-motion) AND statically. The LS20 features an easy-to-read LCD display and intuitive keypad design, and can be mounted where it allows drivers to enter and save 250 unique truck IDs complete with tare weights, individual axle weights and total gross weight. Internal memory stores up to 3,000 weigh records and the data can be exported via a USB drive or RS232 serial output creating a complete, automated manned or unmanned weigh station. “A key benefit of this system is that it allows users to collect individual axle weights to identify overweight axles or monitor inventory levels in entry/exit gate applications,” said Aaron Van Heel, Marketing Manager at Intercomp. “New components like the LS20 indicator create a complete system package for a larger variety of applications, including automating remote operations,” he continued. “Intercomp’s Axle Scale System can also be tied in with an optional outdoor wireless printer and a LED Display scoreboard with an integrated stop and go light. Additionally, IntercompWIM software is available to further automate the weighing process for long term data collection and analysis,” Van Heel concluded. For further information, contact Intercomp at 800-328-3336 or worldwide +1 763-476-2531, fax +1 763-476-2613 or write Intercomp, 3839 County Road 116, Minneapolis, MN 55340 USA. Feel free to contact us by E-mail at info@intercompcompany.com or visit us on the web at intercompcompany.com.